Team Australia: Top Effort In Brazil! It was time for redemption for Junior Max Driver Jaiden Pope who has put in an intense effort since the 2017 RMCGF. Pope was sent back in the field early on in the race and impressively drove back to second and just ran out of laps only finishing two Kart lengths behind the now World Champion. Fellow TWM team mate, Sydney-sider William Seal battled around 14th for the majority of the race but through the diving and challenging racing fell back to finish his first World Final event in twenty second. Team Captain, Ryan Kennedy battled it out in a close DD2 Final that saw only a 10m difference in crossing the finish line between first place and fifth place. Ryan placed fifth with adopted Aussie Ryan Wood right behind him in sixth place. This brings a close to Woods second ever DD2 race meeting. Our third DD2 driver, Damian Ward struggled early in the week but managed to salvage position thirteen in the final. NSW driver Trevor Whitby shocked himself with his results at his first ever Rotax Max Challenge Grand Finals “I was probably a bit conservative through the heats because we wanted to make the big dance but now it’s time to be aggressive and see what we can do.” As a result Trevor moved forward from twenty first to seventeenth. Terry Hanly tried avoiding an incident in turn two but unfortunately ended up involved & took no further part in the race. Hanly had the pace to move forward. Kiwi-Aussie Josh Hart who struggled early on managed to find what worked and drove exceptionally well to finish in eleventh place. Queenslander Ben Jurczak who this week has been his own mechanic as well as driver had the pace all week and kept his nose clean but unfortunately was going for a pass and spun into the tire wall, after re-joining last Jurczak retired from the race resulting in a DNF. In what was a smart clean race Shayne Piper Race Engines driver Costa Toparis moves from ninth up to fifth in his first ever Mini Max World Finals event. Costa will be one to watch in the 2019 Sparco Rotax Pro Tour. He ended the week with some well deserved luck and finished the final. Micro Max driver Jake Rutkowski finished an impressive 17th racing wheel to wheel throughout the final. Jake should be proud of the way he conducted himself through the week despite his bad luck remaining positive and taking racing for what it is. That’s a commendable attitude to have at such a younge age. In the Nations Cup which is determined based off of the Teams Result Australia again had a strong year resulting in standing second on the podium against close to sixty other countries. 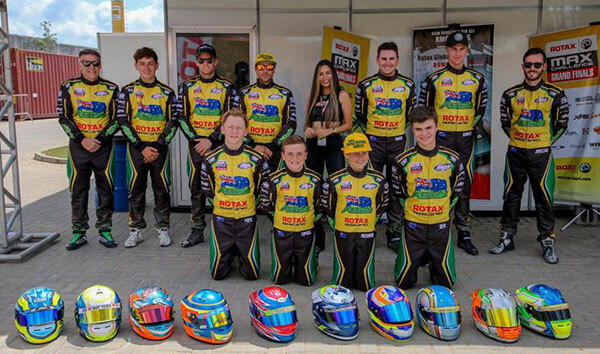 Team Australia, you have done the community of Karting proud in yet another strong year at the Rotax Max Challenge Grand Finals. We wish you all safe travels home and look forward to seeing you all at Todd Road in January to start your journey to the World Finals in 2019.